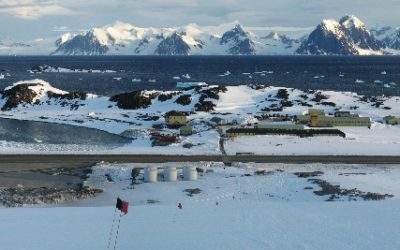 Rothera Station, known as Rothera Point until 15 August 1977, was established in 1975 to replace Adelaide, where the glacier ski-way had deteriorated rendering the operation of ski-equipped aircraft hazardous. 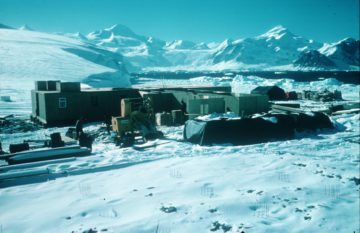 A party camped at Rothera Point in the 1975/76 austral summer to open up the air facility. There was a phased construction programme so that by 1980 the station provided accommodation, electrical power generation, vehicle workshops, scientific offices and a store for travel equipment. From Rothera’s inception to the 1991–92 austral summer season, BAS Twin Otter aircraft used a glacier ski-way 300m above the station on the Wormald Ice Piedmont. During that summer a gravel runway and hangar facility was commissioned bringing a more reliable air operation and the possibility of a passenger aircraft link from outside the continent. Before that, everyone coming to Rothera had to depart from the Falkland Islands by ship. Today the development of the Rothera site continues. This is not an expansion but an ongoing programme of replacing old structures making best use of new technologies. Improved insulation and energy production and management systems can further reduce the environmental footprint of the station. Marine biology, deep-field support to glaciology, geology, geophysics and survey. Main air facility and field work centre. 25 Oct 1975 to present. The station was initially planned and constructed in 3 phases to spread the costs. First hut erected on 1 Feb 1976. Phase II was built in 1976/77. This included the main accommodation block, power house and tractor shed. An old storage shed from Adelaide (Station T) was erected close to Phase I and known as the Bingham building after Surgeon Commander E W Bingham, leader of FIDS 1945-47. Phase III was erected 1978/79. This building included scientific offices, travel store and a coldroom. In 2001 it was named Fuchs House after Sir Vivian Fuchs, Director of FIDS/BAS 1958-73. Further building work has been undertaken when required. Phase IV, begun Nov 1985 and completed in the 1986/87 season was an extension to Phase II. In 2001 it was named Bransfield House (after BAS ship RRS Bransfield). A wharf and gravel runway (with bulk fuel tanks and aircraft hangar) became operational in the 1991/92 season. The former was named Biscoe Wharf after the BAS ship RRS John Biscoe. A new storage hut, called the Miracle Span, now used primarily for waste management activities, was also constructed in 1991/92. 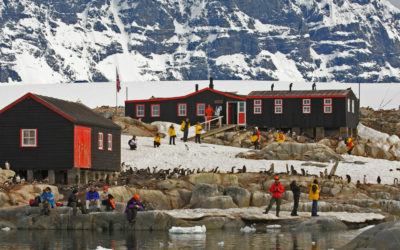 Under the next phase of development, a boatshed was completed in 1994/95, a transit accommodation block in 1996/97 (named Giants House in 2001 after the Rothera sledge dog team “Giants”), and a new generator shed. The Bonner Laboratory became operational in 1997, housing biological research facilities when Signy (Station H), was reduced to summer only operations. It was named after W N Bonner, biologist 1953-86 and Deputy Director of BAS 1986-88. A new accommodation building was erected during the 1999/00 and 2000/01 seasons. It was named Admirals House after the Rothera dog team “Admirals”. Also in 1999/00 an air operations control tower was added to the north end of Bransfield House. The Bonner Laboratory was destroyed by fire on 29 Sep 2001 but rebuilt in the 2002/03 season, when a sewage treatment plant was also erected. A new living block, including canteen, library and recreational facilities, was completed in 2007/08 and named new Bransfield House. The upper floor of old Bransfield House then became redundant. 2013 Dirck Gerritsz Laboratory was officially opened on Sunday 27 Jan by Leo le Duc on behalf of the Ministry of Education, Culture and Science of the Netherlands.  A collaboration between the British Antarctic Survey and the Netherlands Organisation for Scientific Research (NWO) – hosting 4 research projects. A hut was established on Lagoon Island 30 Nov 1989 as a shelter for those on recreational trips. Two field huts were erected on Léonie Island in Dec 1996. 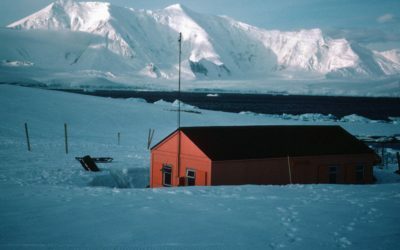 Known as the Melon hut and the Apple hut, they were provided by the Netherlands AntArctic Programme (sic) during a collaborative study with BAS. A second Melon hut was erected at Two Step Cliffs, Alexander Island, in 1998/99. S E Black, D Statham and G Stride, 27 May 1958: memorial at Rothera Point. J H M Anderson and R Atkinson, 16 May 1981: single cross on Rothera Point. N J Armstrong (Canada), D N Fredlund (Canada), J C Armstrong (Canada) and E P Odegard (Norway), 23 Nov 1994: memorial at Rothera Point. K M Brown, 22 July 2003: memorial at Rothera Point.